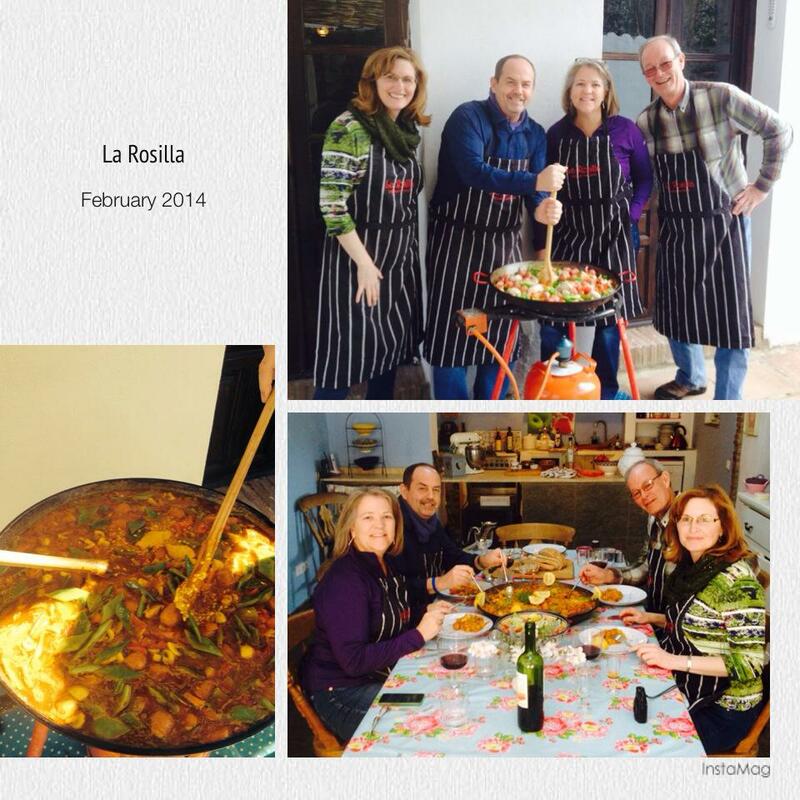 andalucia | La Rosilla - Lifestyle and food. Time for a change, instead of heading south to the coast, we drove north inland slightly, to the nearby ancient town of Antequera. We enjoyed a morning of ambling through the streets, window shopping, coffee sipping, monument and church visiting. Cobbled streets and beautiful architecture, adorned with traditional geraniums, overflowing from their terracotta pots, gives the town a deep Andalucian air. We decided to delve a little deeper for our obligatory lunch stop, and came across the wonderful Caserio de San Benito just a flew more clicks up the main A45 heading north. This delightful cortijo stands proud and welcoming, with courtyard filled with olive trees, and thrashing ground. On entering the restaurant, you are taken back to a bygone era, the dining room is beautifully laid and boasts antiques and regalia of this agricultural area. Welcoming staff greeted us, and recommended dishes. The house white wine was perfectly chilled and served in a deliciously large measure. Warm bread, crackers and Ensaladilla Rusa was served while we chose the Menu del dia and were not disappointed. Our main courses of lamb cooked on wood fire with garlic, and Secreto Iberico, were rich and tasty. We shared a pud with two spoons, a decadent home made cherry cheesecake, YUM. Two cafe solos were need to get us up and out of this wonderful place, we could’ve have sat there all afternoon. 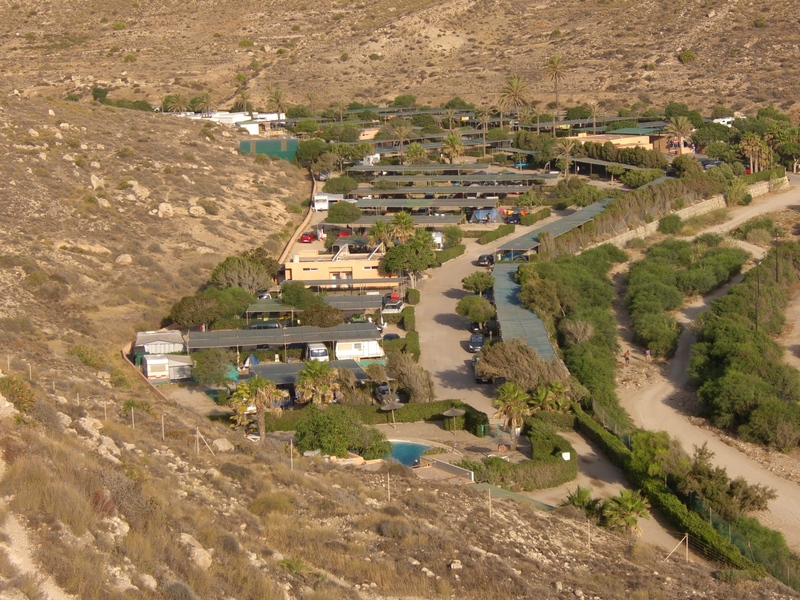 We shall return, and no doubt take many guests from La Rosilla and recommend to others. Semana Blanca, blue sky, warm day, let’s go ! Semana Blanca, is celebrated in the province of Malaga with a week off school, because rightly so all our main Ferias are celebrated in August, and the Junta (Government) believe we need extra time off 😉 This week also coincides with ‘Dia de Andalucia‘ a day we celebrate and commemorate for when the province became a Autonomous region. For the 9 years I have been here, Dia de Andalucia has always been a day of beautiful weather, a day of hopefulness and a reminder to me why we chose to live here. over the years we have celebrated in many ways, grouping together with friends, sharing typical plates of food, doning green & white and making merry. This year, with children growing up and lives getting busier, at home was just my OH, and no 3 daughter ‘Noo’. So we made the most of just having our youngest in tow, and headed to the coast in search of a few more degrees warmth, places we’d passed but not stopped at and a few family favourites. First stop the Buddhist Stupa in Benalmadena, this stunning white temple, with gold dome is a perfect backdrop to the blue Mediterranean sea. Perched high on the coast, this wonderful place, was peaceful and calming and exquisitely decorated . Funded and built with one man’s dream, now funded by donations. Incense lighting for a dream. Just across the road, The Mariposario (Butterfly exhibition) awaits . Built as a Thai temple, this tropical park is beautifully presented and designed. Tropical plants, cretaures and 1000’s of butterflies are housed, cultivated and cared for here. The whole biological ‘Butterfly’ cycle can be witnessed and is very well explained by the staff, from caterpillar, chrsilis to graceful butterfly. Eye spy ‘ Butterfly’ is encouraged for everyone and a spotting paper given to all. Orchids, succulents and spectacular flora, are enjoyed by birds, Iguanas, Chameleons and even a Wallaby and Tortoise. Lunch of course, off to the prom we went. The glorious weather had bought out the hoards, locals & tourists, flip slops & shorts 😉 Restaurants and chiringuitos were being queued for, restaurant Maitre D’s promoting there menus, to the wandering crowds. We knew what we wanted, simple Andalucia fayre to celebrate the day. face in sun, cerveza in hand, espetos (sardines) on the fire, the famous and alluring aroma of the Costa in the sun. Suitably fed and watered and cheeks pinked, bag stuffed with bread to feed the ducks, a stroll around our family favourite park was called for, Parque de la Paloma in Benalmadena, are lush gardens, lakes, waterfalls, rabbits, chickens and ducks waddling free. Adventure parks and cactus gardens, picnic places, bars , fun for all the family. One more attraction to tick off. A rather surreal place, again built by one mans dream to celebrate his interpretation of architecture through many eras and styles. Byzantine, Moorish, Baroque & Gothic. Built out of stone, terracotta and cement the Castillo de Colomares is an intriguing place to wander around for an hour or so. Built over 7 years, it now stands high into the hills of Benalmadena Pueblo. Those with creative or dramatic minds can be transported into a world of make believe, others may just wonder why ? You decide. I’m the queen of the castle. 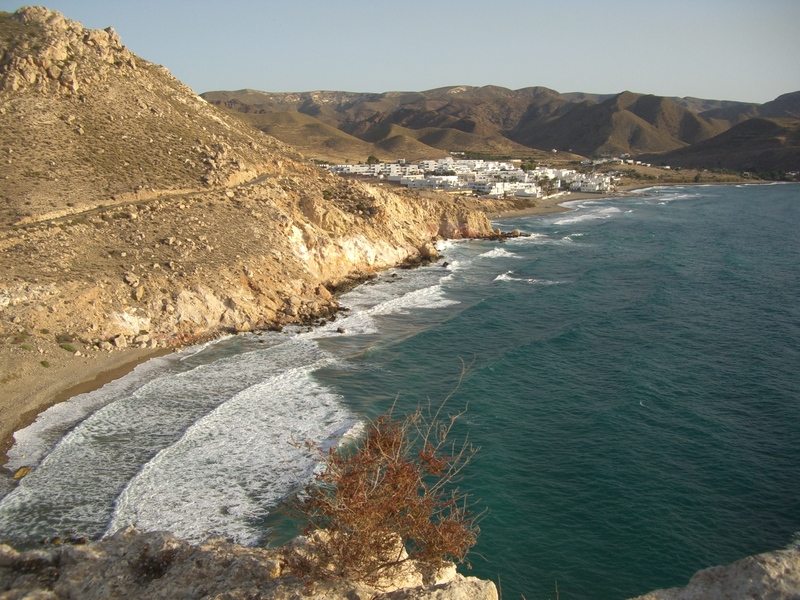 Walked, eaten, played, explored, learned, climbed, discovered – Andalucia solo hay una ! 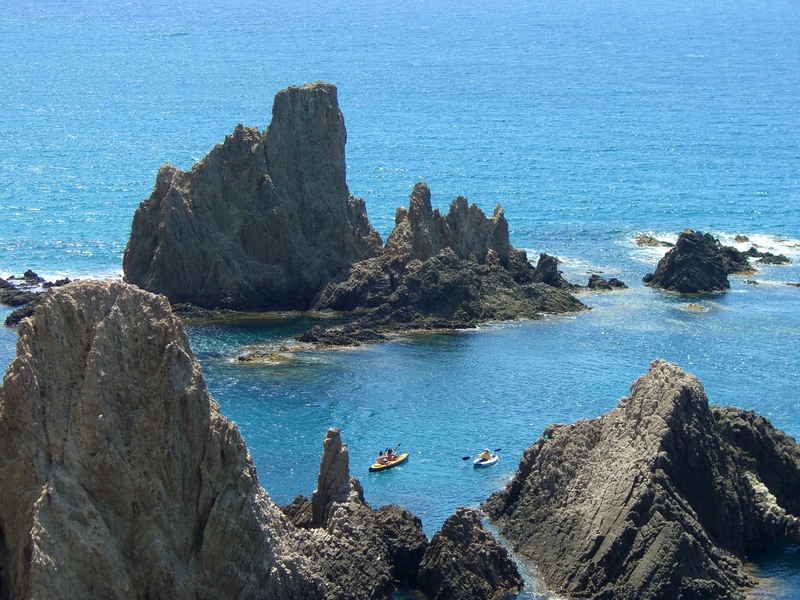 Experience these wonderful places yourself, whilst holidaying a La Rosilla. 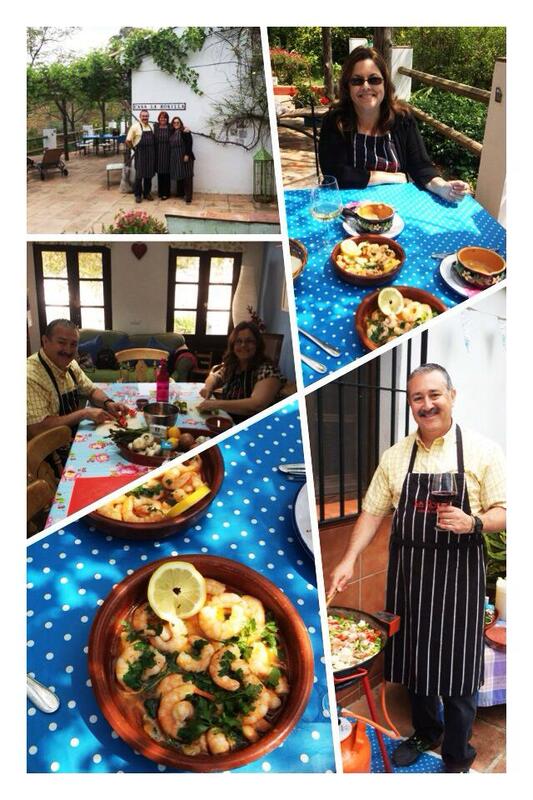 Yesterday I was joined at La Rosilla, for the first Cooking & Culture Day of the year, by guests from America. It was a chilly day in the mountains, but still breathtakingly beautiful with all the Almond trees in blossom, guests were kept warm as they cooked their giant paella, whilst sipping sherries by the fire pit. Tapas of peppers stuffed with goats cheese, banderillas, cured chorizo, wild mushroom pate and confit cherry tomatoes and single estate olive oils were sampled and enjoyed around our country kitchen. 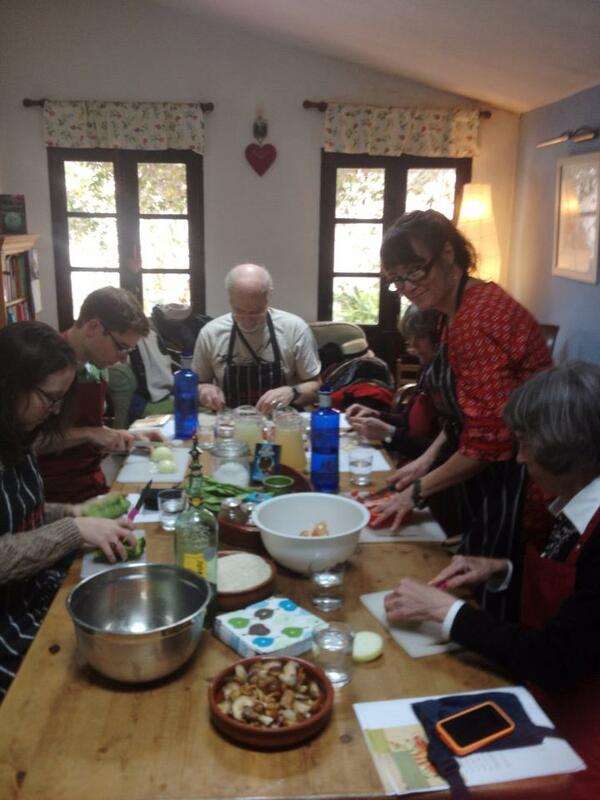 The groups creations of homemade bread & chicken, chorizo and green bean paella , with garden salad were devoured. The sun came out just in time for ‘Tarta de Santiagio’ a rich almond tart and comforting PX sherry to be savoured on the terrace and time to soak up the view. We packed up the van with all the necessary refreshments ,like normal enough for days 😉 picnic hamper, rug and met up with our traveling companions and friends John & Maria and set on our way. 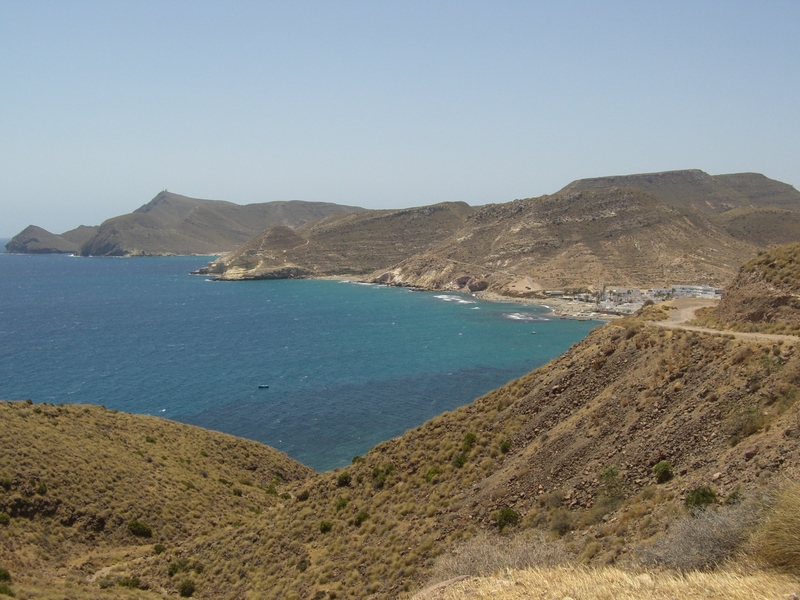 Now we are hot in the ‘Montes’ but as we ventured more inland the temperature crept up. 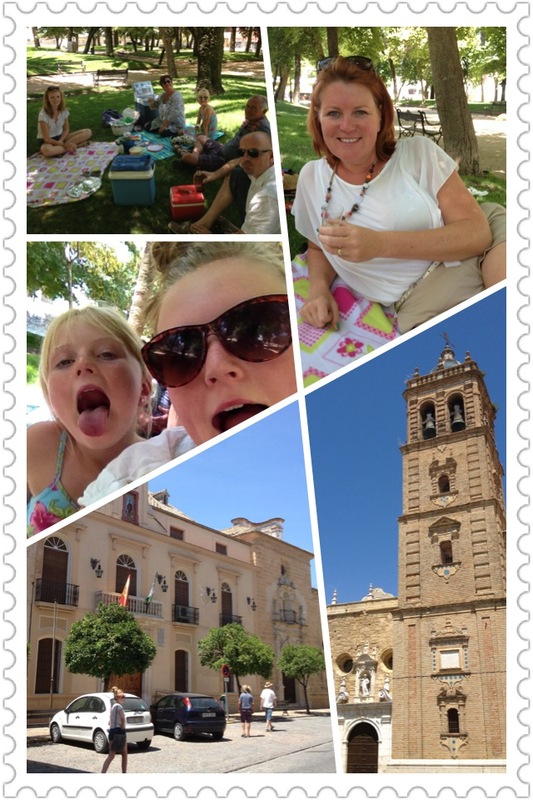 We stopped at Montilla on the way for our picnic feast, thankfully finding a lush park with grass !! and shady trees . This pretty town was deserted, well I suppose only mad dogs & English men, would be out in the full heat of the day and especially the night after the town feria with a temperature of 45 degrees !! We sat glowing and feasting as you do 😉 . Not a soul in sight, we braved a short stroll around the town in search of cool liquid refreshment, finally , parched we stumbled into the only bar open, which happened to be majestically decorated, with typical Cordoban stone mosaic floor and beautiful tiling . Onwards we went, with a slight city detour, that’ll teach me to ‘tweet’ whilst trying to navigate ;). Traveling past fields of sunflowers and olive groves proudly manicured, the rolling countryside was vast and impressive. Nearing our destination we met with Alan, who guided us through the groves until we spotted our first Alpaca and our lodgings for the night. What a welcome sight The Olive Mill was, with its white and blue walls, and potted plants. 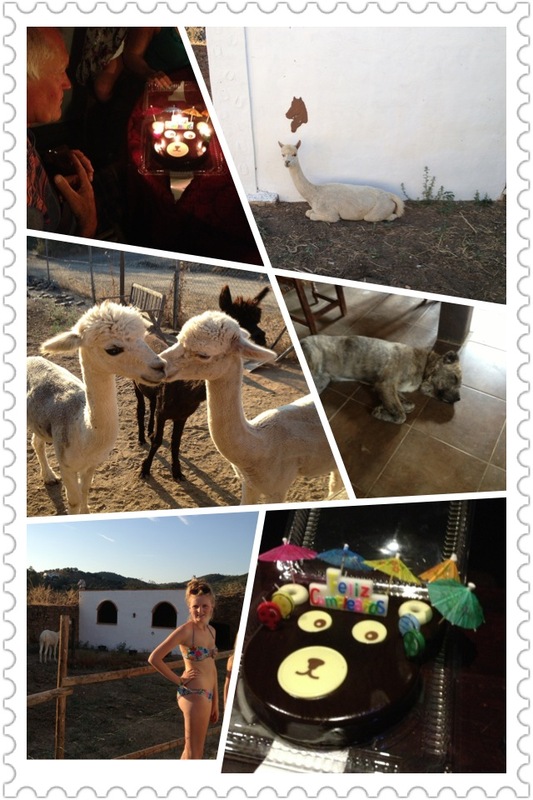 The Alpacas lazily grazing and sunbathing in their paddocks. The original mill stones sat proudly in the entrance courtyard. The mill a wonderful place to getaway from it all, recharge your batteries, and experience life a slower pace. Alan & Lorna’s hospitality was wonderful, and such a treat for me to be cooked for. After the Alpacas were fed, and we’d cooled off in the refreshing pool, showered and the sun was setting, we were treated to a sumptuous barbecue in the courtyard by candlelight . Up the stairs to bed, we enjoyed a night-cap and the most comfortable nights sleep, albeit not long enough, as I was awoken to, “Mum, it’s Alpaca walking time” . Slightly jaded I joined the others in the already fierce morning heat, for our jaunt. Nellie had chosen her favourite ‘Rafa’ as our walking companion, and much to the delight of the others, he led me a merry dance , diving into bushes to scratch his back, lying down to roll in the dust and just generally keeping me on my not so energetic toes 😉 Back for a leisurely lavish breakfast, and a paddle in the pool to cool our feet , we thoroughly enjoyed our short experience, we all loved the alpacas, the giant lazy dogs Arthur & Blue, and the kittens, but most of all Alan & Lorna who made us so welcome. It’s a joy to share what I love with guests that visit – A little of my life, the flavour and the dishes of the mountains. This year so far, all my visitors for La Rosilla’s ‘Cookery & Culture’ day , have come from America, all corners of the States. In fact I would like to get a big map on the world and put a pin in each place, visitors come from . Not only do they experience a taste of our family life on the mountain, we get a taste of theirs. Recipes, traditions and lifestyles are chatted about, whilst they sample, create, sip and and enjoy some of ours. 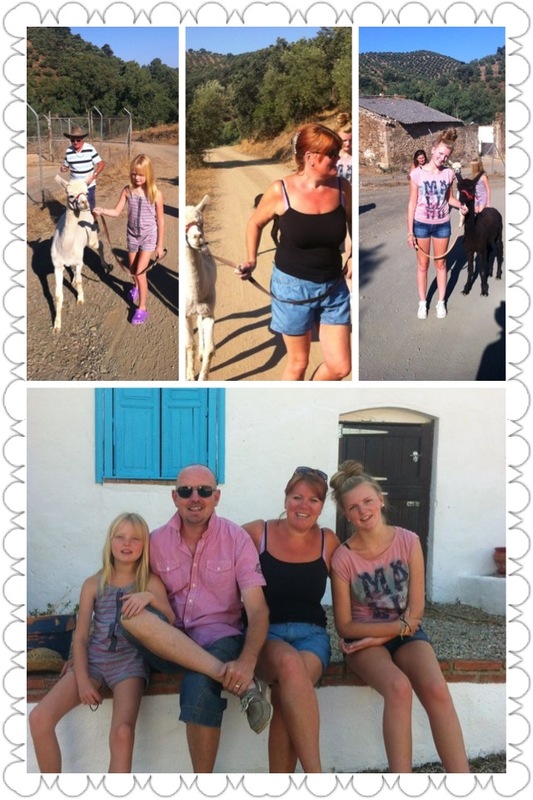 They have all been intrepid travelers, making the most of their short time in Andalucia, and definitely not concerned about driving and exploring and going off the beaten track to take a peek . My guests usually are traveling to celebrate, birthdays, anniversaries, time out and just generally creating memory moments to take back home. I just adore the way good food and great company bring people together, my children now have been fortunate to meet some fascinating people from all over the world and learn from it , it also makes them and us aware that where we live is special, and how we live is dreamed of by many. Blogging too, has helped on many occasion when, perhaps I need to sit and take a look at what I’ve achieved, what’s happening around me & what obstacles I have overcome. Also what delicious meals I have created or eaten, I have shared with friends and now a wider audience, all thanks to technology. At a young age, food & travel were always high on my agenda, starting my early working life, in a village pub, waitressing then being promoted to food prep, and then cooking, whilst at college studying Travel & tourism. This paved the way for my adventures to come. Being fortunate to travel to some far-flung places as a Tour Representative, led hand in hand with trying new cuisines, visiting some of the worlds best restaurants, thus confirming ‘yes’ food was going to pay a major part in my life. 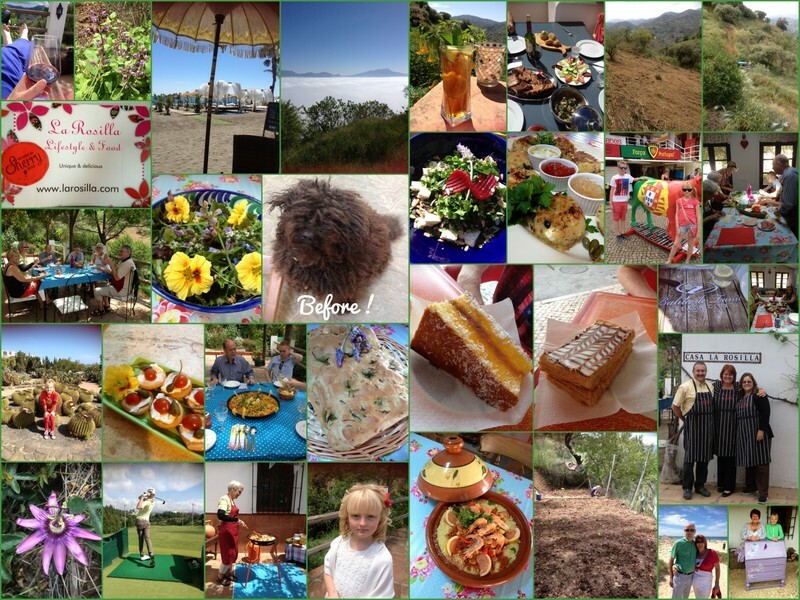 After my travel career, family life started and the story goes on…..
You can read about the next part of my journey from Warwickshire U.K to the mountains of Andalucia, and how my ‘Foodie’ quest has continued. 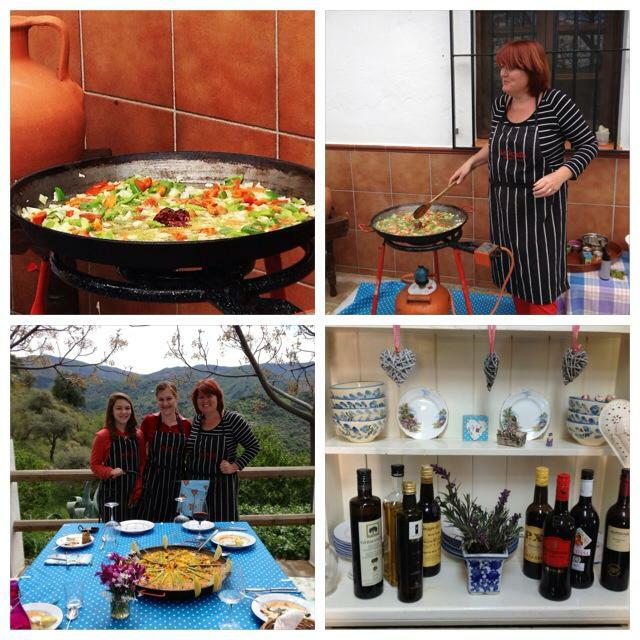 From Midlands to Andalucia – ‘Journey of a Foodie’ – Courtesy of Midlands Food Bloggers.